Nashville attorney A. Gregory ("Gregg" not "Greg") Ramos and Nashville attorney Mario Ramos are not the same person, nor are they related. Still, sometimes Nashville can't get tell the two men apart. Gregg's office will get calls from people seeking immigration or criminal advice, two areas in which Gregg does not practice. After Gregg was elected to the presidency of the Nashville Bar Association in 2004, two colleagues congratulated Mario. Mario celebrated his birthday last week, but Gregg was getting some of Mario's well-wishing. Admittedly, both men have at times been a "go-to" source for local media seeking comment on Hispanic issues. Mario was once president of a local group called "Unamonos" and was often quoted in the late 90's (the Nashville Scene called Mario a spokesman for all immigrants in 1996). Gregg's press appearances have been more recent. He has been asked for comment on the Welcoming Tennessee Initiative, the case of Davidson County's 287(g)-driven shackling of Juana Villegas, and the citywide effort against the English Only campaign. Gregg was also on the cover of the Nashville Scene earlier this year as Nashvillian of the Year. Mario has been more actively engaged in social media through his Facebook account, law firm blog, and a short-lived YouTube channel. Gregg is on LinkedIn, but he's not on Facebook. Mario was recently recognized by the American Immigration Lawyers Association (AILA) with an Advocacy Award for Outstanding Efforts in Support of AILA’s Legislative Agenda. Gregg was recently named among the "Best of the Bar" by the Nashville Business Journal. Mario is married to Iris, and their two children are Maximiliano and Alexandro. Mario's father Andres passed away in 2005 and was buried in Woodlawn Memorial Park in Nashville. Mario's parents' roots are in Colombia. Gregg's wife's name is Sandy, and their two children are Melody and David. Gregg's father Luis passed away in 2002 and was laid to rest in a veterans' cemetery in Phoenix. Gregg's parents' roots are in Mexico. Mario Ramos' bio is here. Gregg Ramos' bio is here. 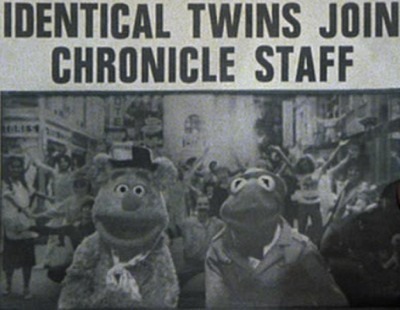 The confusion of Gregg and Mario reminds me of the Great Muppet Caper gag in which Fozzie Bear and Kermit the Frog are described as identical twins. Final note: Another Nashville attorney - Fernando Jose Ramos, BPR# 011105, who is neither Gregg nor Mario - was suspended by Order of the Tennessee Supreme Court on July 8, 2009 for a period of three (3) years. (Source: tbpr.org). And on April 2, 2009, the Williamson County Circuit Court's criminal conviction and suspension of attorney Fred Ramos was upheld in part and modified in part by the Court of Criminal Appeals of Tennessee. (Source: tsc.state.tn.us). Out of an abundance of caution, I'll not say whether Fernando and Fred are the same man. While the fates of Fernando Jose Ramos and Fred Ramos also cause unwarranted confusion with Mario Ramos and Gregg Ramos (misdirected condolences have been offered), the names "Fernando Ramos" and "Fred Ramos" are not nearly as prominent in the local press or as subject to popular confusion as Gregg and Mario.